Get the chance to explore the ancient monuments along the shore within in depth cultural entertaining program full of historical information. You will get through an amazing cruise to enjoy the ancient temples and monuments along the two sides of the river’s shores in Luxor and Aswan. Nile River cruise gets you through an adventure full of history of the ancient Egyptian culture while you enjoy the beautiful views of the Nile during the cruise. On the cruise, twenty four hours customer service, well prepared cabins provided with air condition, Telephone, T.V connected to the satellite channels. You can enjoy the view of The Nile River through the crystal clear windows in your own cabin. The Room service is available 24 hours, dry clean, laundry services and an open buffet that serves you breakfast, lunch and dinner with different kinds of delicious and spectacular food. Most cruises are provided with a clinic, internet café and library. You can find at least one swimming pool, practice your daily exercises at the gym to stay fit and buy gifts from Boutique and other cruise shops. In the evening comes the magic. While enjoying your dinner under the moon light looking at the sky millions of stars, you would enjoy the evening folkloric shows; Tanoura Sufi dance, Nubian music and dancers, Galabayeh night and belly dance show. Visit the most stunning historical places that you will never find anywhere else. Sightseeing tours during the cruise trip are the main course; visit The Valley of The Kings passing by The Karnak Temple, Luxor Temple and Edfu Temple. Visit Kom Ombo and the Philae Temple in Aswan. You will enjoy the historical background, free time to take photos and explore the place yourself. Nile Cruise tours include usually knowledgeable, well cultured representative tour guide that is an expert of the historical places you would visit. 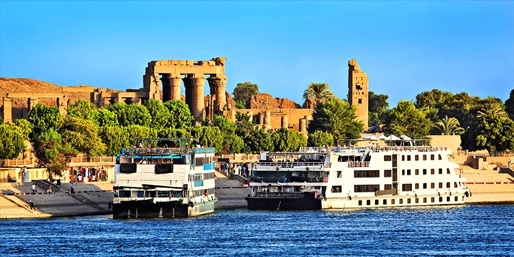 The Nile River Cruise will take you to the world of historical magic. You will feel like you are a part of this spectacular ancient culture.